If you follow me on twitter I wonder what you think of me? Not very much probably, because I expect you are far too concerned with what I think of you. Round and round we go, filling our waking thoughts with fears of ‘unfollows’, ‘ignored @s’ or that we might mistakenly reveal our ‘true personality’ on the internet in a moment of drunken madness for the world to RT and ridicule. 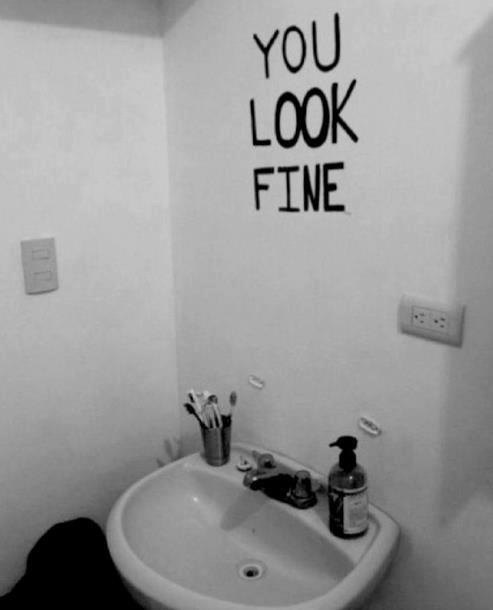 Listen up friends: there is no instagram filter on the bathroom mirror. Sometimes I wonder what we used to do with all these thoughts before twitter (and then I tweet that and wait anxiously for a response…). Sometimes I wonder where we got our feelings of validity, that what we are doing, thinking, eating at this precise moment is OK BY THE REST OF THE WORLD (or at least by the 267 people/ spambots/ hookers in America that follow our accounts). Sometimes I wonder if any thought really counted before it was painstakingly spelled out in 140 characters. I know a lot of people IRL (in real life) that I follow on twitter who seem to manage concurrent lives; one is overwhelmingly confident, beautifully filtered and never really that hungover, the other is… well… drunk. If I am being honest one of those people is a little bit me. But it just seems to beg the question: why? Why does it seem like we are putting more effort in to our online personas than our ‘real life’ ones. Maybe if we can fool our followers into believing we have a perfect life full of early morning jogs, green tea and fancy cocktails then does it really matter what our own mothers think of us? Or is it more the fact that we need to fool ourselves? The world of social media has definitely made it more difficult to hide. If you want to be a part of the online community you have to give something of yourself, blogging, twitter, another Facebook photo album… You’re either in it or you ain’t, and if you are then it seems like you can never give enough. But with the giving comes the judging, the reflection and the justifications, from complete strangers, your best friends and yourself. Who can blame us for creating a digital fantasy version of ourselves? Maybe in the world of online, where words and pictures exist forever, it’s essential. The internet holds a mirror up to our lives. Sometimes it’s a distorted mirror, like you would find in the circus, but if we look hard enough we can see it is still us standing in front of it. And no matter what you want others to believe about your reflection, just make sure that you, at least, know the truth. It is pretty amazing what Orbit Words is morphing into after five short weeks. Sometimes it seems like it has a life of its own and all I can do is hang on and enjoy the ride. The digital and design side of the business is really taking off as, although people need words, they need somewhere to put them too. They want them to look nice as well as sound good, and they want to make sure they are being read. So we have been busy working with business start ups, helping them with their websites, social media and marketing strategies; individuals who want creative, digital wedding invitations to wow their guests; putting together a website design and framework for a group of collaborative lawyers (learning way too much about divorce law in the process) and obsessively proofing, proofing and proofing any and every document sent our way. As well as that we have been out and about, working in partnership with a number of charities, offering our support with funding applications and PR launches, getting our words to work for the people who are really making things happen. There’s more too, some exciting projects emerging with Cahoona, one of the hardest working digital agencies in Manchester (more about that another time…) and a huge national initiative by Rathbone UK and Odd Theatre. Starting a new business is a bit like running a marathon. To be honest I don’t know for sure as I haven’t yet managed 26.2 miles, but I am hoping I will complete the famous course in London this April. Training has been tough so far, I‘m not going to lie. Getting motivated to start when the finishing line seems so very, very far away; it’s cold, it’s dark and couldn’t we just have a nice glass of wine and talk about it instead…? Then once you get out there you have to keep going. If you get a stitch, if your feet hurt, if it starts pouring with rain, one trainer must pound in front of the other. Because all you can really think about is the last mile, the mile when you know it has all been worth it. You might be half the person you were: limping, crying, perhaps being carried by some super human 90 year old who puts you to shame, but what’s important is that you set yourself a goal and you achieved it. It is the goal that keeps you going. I have been far less physically challenged by setting up Orbit Words than my marathon training. I haven’t had to ice my fingers after too much typing and I haven’t sat at the computer crying my eyes out because IT HURTS (yet…) but I have had to keep believing in the goal. I have had to quiet the disbelieving voices in my head and be 100% sure about reaching the finishing line. I want to build a reputation as a reliable, flexible, creative and bespoke service provider. I want to have the opportunity to make my words come to life. When I suffered a knee injury earlier this month it did affect my training but mostly it affected my confidence. It is hard to believe in yourself when it’s your own body saying it can’t be done. But I have had to keep the same commitment to training as I have to Orbit Words. The moments when you don’t believe are nothing compared to the moments of excitement, energy and passion when you do. And so I will keep on running and I will keep on writing. In April we will know if I can run 26.2 miles, measuring the success of Orbit Words will take a lot longer, but I know that I will keep on chasing that feeling of crossing the line. Thanks to everyone who has cheered me on so far.